To unlock Magneto during Spec Ops for of Marvel Avengers Alliance you need to collect 8 comic book covers which you can get from unlocking Lockboxes. Here's the Crappy part - While you can guarantee that you'll receive a comic book cover by trading in 10 lockboxes (or try your luck by opening one box at a time for a 7% chance of gaining a comic book cover), it is possible to get the same covers that you've already collected which makes the task a bit more daunting. If you get the same cover, you gain 10000 Silver instead. You can also gain lock boxes by completing the Master of Magnetism Sidequests Tasks. I've listed them below. You'll notice that the skip costs will run you more than actually buying an equal amount of boxes to the reward (i.e. don't pay gold to skip). The sidequests don't appear until after you complete Task 7 of the Spec Ops 6 Tasks. These are optional tasks to help you obtain more lockboxes. 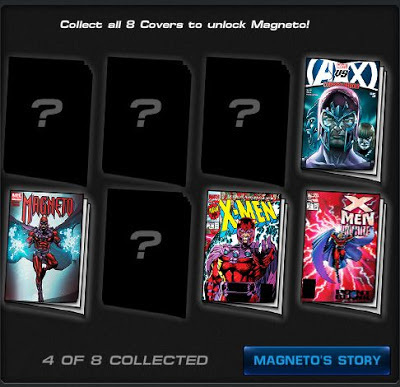 Completing all of them will not unlock Magneto; only collecting all 8 comic book covers will. 1. No Mercy: Defeat 10 Hellfire Club Soldiers - Hellfire Club soldiers are the best mercenaries that money can buy. They can be found in Mission 1. 2. Brotherhood Hunt: Defeat 5 Mutants - Toad, Blob, Juggernaut, Sabretooth, Dragoness, Mystique, and the Living Pharaoh are all mutants (can be completed in normal missions. Defeating Magneto counts too!). 4. Bot Buster: Defeat 15 Sentinels - Sentinels are built for destroying mutants. They can be found in Mission 2: Brotherhood In Arms (can be completed in normal missions). 6. Completionist: Complete 4 Stars of Mastery in all Spec Ops 6 Missions - Complete missions to add points to your cumulative score. Achieve a high enough score to earn a new Mastery Star.